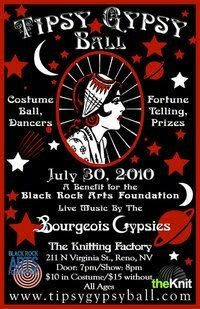 RENO, NV – On a hot summer’s night, a gypsy caravan rolls into town and unloads dancers, musicians, fortune tellers and magic for a one night show at the Knitting Factory on July 30th to benefit the Black Rock Arts Foundation. All will be entertained, rewarded and participate in the hoopla, with prizes for best costume, King and Queen of the Ball, giveaways to upcoming shows, CD’s, T-shirts and trinkets. Dance your feet and clap your hands to the Bourgeois Gypsies, who have traveled near and far across the US and Canada, from festivals to clubs, to perform for you with a host of the best local talent, to make for one very Tipsy Gypsy Ball. All ages are welcome.